We are a Melbourne Metropolitan based company, capable of servicing not only metropolitan area, but country areas also. Power Concrete Cutting is one of the leading Melbourne concrete cutters, offering the best in service and customer satisfaction. Proudly serving the Melbourne area since April 2000 , Power Concrete Cutting is experienced, reliable, and ready to take on your concrete cutting projects. The Power Concrete Cutting team has a combined workforce experience of over 90 years. As well as being experienced concrete cutters, all our operators are trained as per industry guidelines and industry training manual. This ensures that the work is done safely and efficiently. We only use modern and well maintained concrete cutting equipment and ensure that all our equipment is serviced regularly. 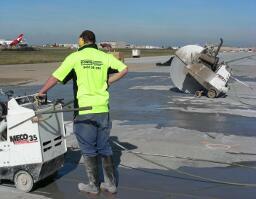 Power Concrete Cutting is also a proud member of the Concrete Sawing and Drilling Association Australia (CSDAA). Power Concrete Cutting was founded in Romsey in April 2000, starting with only 2 operators. We have expanded to a modern well equipped fleet of 7 operators and are now based in the Melbourne Metropolitan Area. Copyright © 2019 Power Concrete Cutting. All Rights Reserved.